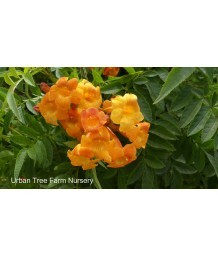 Orange EsperanzaEvergreen shrub. Can be trained as a tree. NOT FOR ZONE 14. Bright green leaves with..
Cape HoneysuckleSemi-evergreen shrub. Deciduous in cold winters. 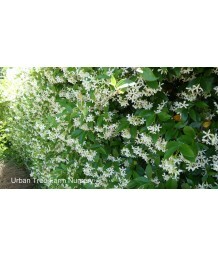 Can be trained as a vine or left as..
Cape HoneysuckleSemi-evergreen shrub. Trained to grow along an upright stake in the center of the co..
Black-Eyed Susan VineEvergreen vine. Often treated as an annual. NOT FOR ZONE 14. Climbing habit, co..
Asian JasmineEvergreen vine. 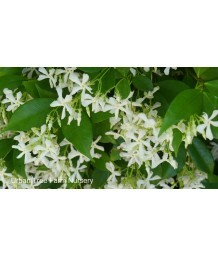 Vigorous twining or sprawling vine displays small, fragrant creamy-yell..
Root Beer Scented Star JasmineEvergreen vine. This specimen retains the plant's natural, bushy shape..
Root Beer Scented Star JasmineEvergreen vine. Trained to grow along an upright stake in the center o..
Trachelospermum jasminoides 'Variegata' STAKEDEvergreen vine. Trained to grow along an upright stake..
Star JasmineEvergreen vine. This specimen retains the plant's natural, bushy shape and has no stake ..
Star JasmineEvergreen vine. Trained to grow along an upright stake in the center of the container. M..
Star JasmineEvergreen vine. Already trained to grow on a trellis. Moderate growth rate. Needs suppor..